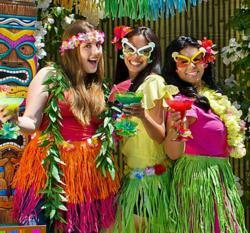 North America’s largest party retailer, Party City, helps consumers spice up their patios as they dust off their grills for summer. With gas prices rising, more families are opting for stay-cations over lavish trips, so the experts created simple and chic party ideas to liven up any backyard gathering. Alternative Alohas: Surprise friends with an unconventional salutation by saying “hello” in style with message-in-a-bottle invitations. Continue the welcoming beach theme from invite to party entrance with authentic Polynesian-inspired decorations outfitting the front door. From parasol wreaths and hibiscus leis, greet guests with an oasis experience right at the front door to get the island vibe started. Tropical Tablescapes: Use bright colors in decorations and tableware to amplify the summertime feel. Make fresh tropical flowers go farther by marrying them with beautiful, affordable luau tableware. Mix and match patterned plates with solid chargers and bamboo placemats for a custom look. Accessorize tables with grass skirts and floral leis, wrapping them around the backs of guests’ chairs for attention-grabbing detail that is simple to do.